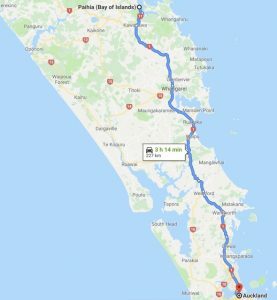 If you get stuck in traffic getting out of Auckland or you’ve started your journey further south, you might need to stop early on in your journey. Straight over the bridge at Takapuna, there’s a great, albeit small playground right next to the beach on The Strand. Parking at the weekends, especially if it’s sunny, can be a bit of a problem but otherwise, there should be something here for all ages of kids with toilets and lots of cafes within walking distance of the playground. If you decide to avoid the toll road, Owera makes a good place to stop as there’s a good stretch of playgrounds along the main road and opportunities for running around, as well as cafes and public toilets. Otherwise you might choose to venture off the highway a little into Puhoi. The Puhoi Valley Cheese Store and Cafe allows kids to burn energy, adults to buy cheese and if you’re in need of a meal, plenty of food to choose from! Warkworth Playground is small but has plenty for younger children to do (perhaps up to the age of 7 or so). It has the advantage of being fully fenced and is right on the waterfront next to the riverside walkway so handy for accessing with a scooter or buggy. If you have kids that are keen on animals and have never seen dogs rounding up sheep, SheepWorld, just north of Warkworth, could be another option for a stop, especially on a rainy day. The shows, which also include shearing displays, happen daily at 11am and 2pm, last for one hour and are inside. There’s a cafe onsite too. More info here. Just north of Wellsford, Te Hana Te Ao Marama/Maori Village comes recommended whether you decide to have the experience of being guided around the old village or just stop for a bite to eat at the cafe and enjoy the surrounding views. Guided tours and times vary throughout the year. More info here. Waipu Caves is definitely a detour inland off the main road but well worth the extra time. You’ll want to have torches and a change of clothes handy including clean shoes but you’ll be rewarded with an awesome view of so many glow worms! More info here. Ruakaka beach isn’t far off SH1 and provides a place for a dip in the sea if you’ve got swimming things to hand. It’s relatively shallow and therefore considered ‘safe’ swimming for kids, although you’ll still need to monitor them carefully. Toilets and showers near the surf club at the end of Ruakaka Beach Road. Just south of Whangarei at Marsden Point is the huge Refining NZ. It’s somewhat of a blot on the landscape BUT it provides jobs for many locals and has a visitor centre which makes for a bit of a different kind of stopping place, great on a rainy day and if you have kids that are into science. There’s a sound and light show that runs every half hour and a full scale model of the refinery. Best of all, it’s completely free! There’s a cafe here too if you’re in need of a meal, snack or just a drink. Open 10am – 5pm daily although closed Christmas Day, Boxing Day and Good Friday. The playground at the town basin in Whangarei is the biggest in the area and offers a good range of equipment including a liberty swing. There are plenty of opportunities for kids to climb, slide, swing and spin. The playground is next to the river with a boardwalk running all along it, perfect for accessing the playground by scooter or with a buggy. There’s also a big (paid) carpark just next to the playground, supermarkets, toilets and plenty of cafes in the area. The playground is closest to Quayside and Reyburn House Lane but also easily accessible from Lower Denton Street and streets off this. Several short walks around AH Reed Memorial Park in Whangarei allow everyone to admire the kauri trees and stretch their legs while not being too strenuous. Not suitable for buggies though on several walks as there are steps. More info including rough duration of walks here.